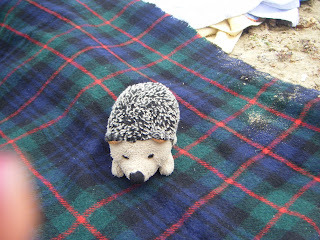 Prickles had a great holiday in France with Ella and Simon. He loved the aeroplane, slept on the top bunk of the bed and went horse-riding and cycling. 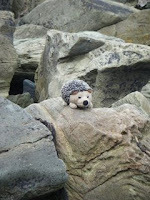 He liked the beach and was even allowed in Ella and Simon's special tent in Auntie Carol's garden. He enjoyed LOTS of delicious French food and he went to a cheese farm and saw where the cheese is made and stored. If like me you enjoyed the Olympics this summer then here are a few videos to remind you of some of the highlights. 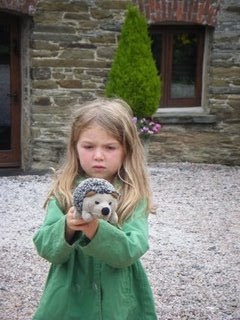 Prickles has had a lovely time with Florrie. 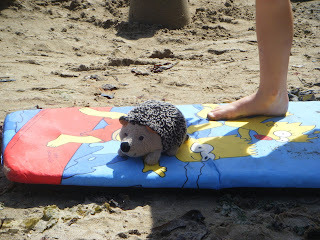 He has been to Devon and had a go at surfing. 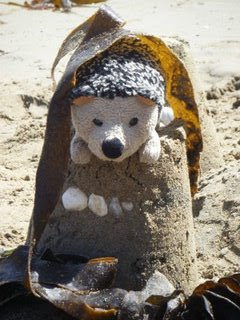 He has made sandcastles and been lost several times! There is a Summer holiday photo competition running again. You can only enter one picture. You need to print it and give it to Mrs Elphick at the start of term. You can also email it to Mr Brook if you would like it to be shown on the blog. I took this photo one evening last week just after the barley had been cut near my house. The evening sunlight on the bales was stunning. Hopefully you can take some great pictures this summer. You don't just have to be on holiday somewhere glamorous - you might spot a great picture close to home. Hello from Mr Brook. 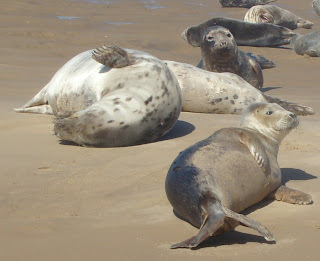 One of the highlights of our Year 6 camp last month was the boat trip to see the seals off the Norfolk coast. 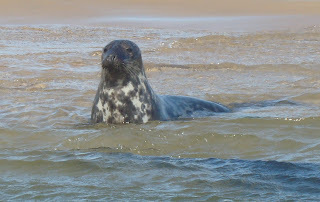 I found out that some of the seals have their pups in August so I was keen to go back and see them. The 'Common Seals' have their pups in August. I saw one on the beach which was only a few days old. The common seals are the lighter coloured ones with rounder faces. 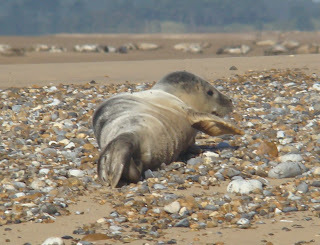 The other type of seal at Blakeney Point is the ' Grey Seal'. They are darker coloured and have longer pointed faces. They are quite rare. Over half the world's Grey Seal population is found around the coast of Britain. They have their pups in Winter - normally in December or January. I would really like to go back to see them early in the new year. I would really recommend a trip from Morston Quay to see not just the seals but also the amazing birds at Blakeney Point. The trip can only be made at high tide because the water is very shallow in the estuary. My trip was with Beans Boats. Their website has the times of boat trip throughout the year - based on the tide times. It is important to book so that Mr Bean knows how many boats to get ready. Follow this link to his website.